Image Files - Restricted to web compatible types ending in: .jpg, .jpeg, .gif, and .png. Files Attachments - Allowable extensions: .txt, .pdf, .doc, .docx, .xls, .xlsx, .ppt, .pptx, .zip, .rar, .avi, .mov, .mp3, .mp4, .jpg, .jpeg, .gif, .png, .tiff, and .bmp. It's easy to upload files. In the email Message section click either of the Jackrabbit files Attach File or Insert Image buttons and then drag the file you want to upload from your computer into the blue box in the Attach File window. Alternatively, you can click the text "Click here to choose a file" to see a traditional file browser where you can select the file to upload. The User ID must have the permission Tools: Upload a File in order to see the Upload Files section. Once a file has been uploaded, it will appear in the bottom section. 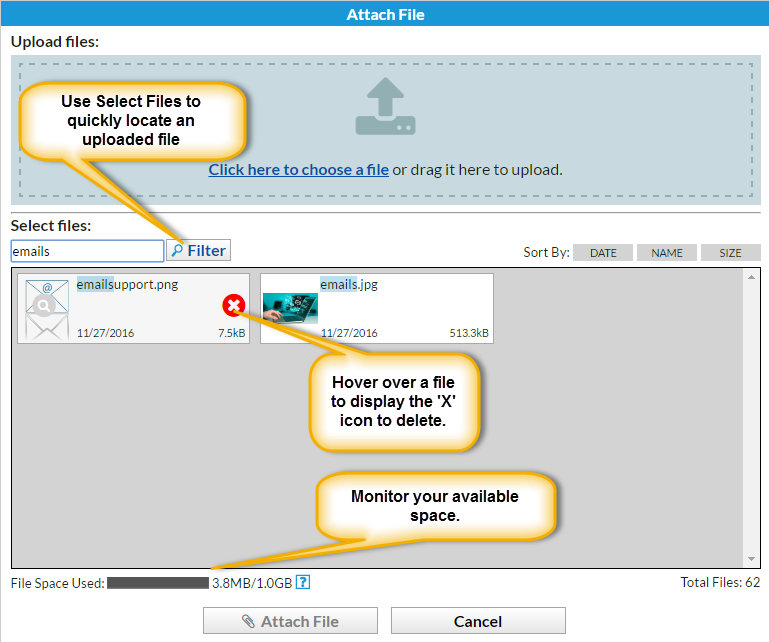 Use the Select Files filter to quickly locate an uploaded file or sort by Date, Name or Size. The progress bar indicates how much of your allotted space (1 GB) has been used. Periodically remove older files to free up space. To delete a Jackrabbit File hover over the file icon and click the 'X' icon. Note: The User ID must have the permission Tools: Delete a File in order to see the 'X' icon. Images can be resized once inserted into the email by dragging the corner to adjust the size. It is a good idea, however, to resize them PRIOR to uploading them so that you do not use up your cloud storage unnecessarily.